Recent political science scholarship examining the institutional features of the rights revolution has highlighted the importance of the private enforcement of civil rights. This article discusses a less well-known line of Supreme Court cases concerning government liability that have undermined effective private enforcement of constitutional rights. 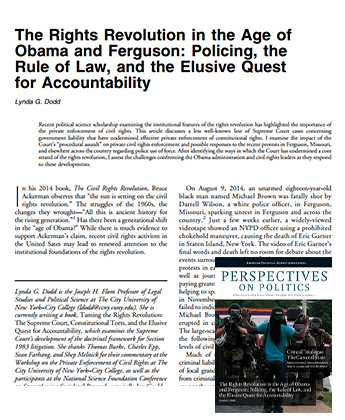 I examine the impact of the Court’s “procedural assault” on private civil rights enforcement and possible responses to the recent protests in Ferguson, Missouri, and elsewhere across the country regarding police use of force. After identifying the ways in which the Court has undermined a core strand of the rights revolution, I assess the challenges confronting the Obama administration and civil rights leaders as they respond to these developments.